Three freight handler jobs have been affected by a New Zealand Post shakeup that will mean mail and courier parcels are no longer transported to Blenheim by plane. From mid-March, mail and courier parcels previously delivered by a Fokker 27 to Blenheim will be flown to Christchurch before being driven north to Marlborough. New Zealand Post Blenheim area manager Grant Sinclair said three freight handler jobs were affected by the move. One person chose to take voluntary redundancy, while two people took new roles within New Zealand Post in Blenheim. There would be little or no impact on mail delivery targets from the changes, Sinclair said. There would be changes to the clearance times on some public post boxes to make sure that mail got to transport trucks on time. Stickers had been placed on those boxes advising customers about the changes, Sinclair said. New Zealand Post had delivered mail using Fokker 27 Friendship planes in Marlborough for the past 25 years, Sinclair said. A Fokker 27 based in Blenheim flew to Wellington, Auckland and Palmerston North, departing Blenheim at 9.15pm and returning at 3am. Sinclair said New Zealand Post's national fleet of two Fokker 27 planes would be put up for sale. They would be advertised in a range of international aviation publications, Sinclair said. He would not disclose what price New Zealand Post expected to get for the planes. In June last year New Zealand Post announced that the company would be replacing its aircraft fleet. A Boeing 737-300 and two Fokker 27 Friendship planes would be replaced by three Boeing 737-400 freight aircraft. New Zealand Post chief executive Brian Roche said the new aircraft were faster and would be able to carry a greater volume of mail, which was important for the company because of the growing market in express parcels and packets. "With more people shopping online than ever before, the demand for overnight parcel delivery has grown, and this will continue." The aircraft would fly in and out of Auckland, Palmerston North and Christchurch, to link up with New Zealand Post's processing and delivery network in those centres. Today Air New Zealand ended its flights between Paraparaumu and Christchurch. Bombardier Q300 ZK-NEK flew both the northbound, NZ8488, and southbound services, NZ8483. The flights between the Kapiti Coast and Christchurch began in on the 4th of November 2013 with the first southbound flight operated by Air Nelson's Bombardier Q300 ZK-NEO and ZK-NEF flying the first northbound service. From this week Air New Zealand will operate two return Auckland-Paraparaumu services on Mondays, Tuesdays, Wednesdays with three return flights on Thursdays and Fridays. On Saturdays there is one northbound service and two southbound while on Sundays there are two northbound and three southbound services. No one has indicated any desire to pick up the Christchurch-Paraparaumu route which is interesting given the impression I heard was that it was generating Saab like loads. Air New Zealand's withdrawal might spark a warning to those routes who are only to get one to two Q300 flights a day from later in the year! Convair 580 ZK-CIB called into Tauranga on its scheduled flight to Auckland to drop off a Tauranga-based tour party that had been out to the Chathams. The photo posted yesterday... ZK-CIE arriving operating Kiwi Regional services while their Saab 340 ZK-KRA undergoes scheduled maintenance. Under the left wing of the Convair is Sunair's Piper Navajo ZK-JGA which will launch services from North Shore to Hamilton and via Hamilton to Tauranga and Rotorua in March. Safety concerns have seen the grounding of Originair branded planes at Nelson Airport. Civil Aviation Authority (CAA) corporate communications spokesperson Mike Richards said it was currently investigating Originair's operator Air Freight NZ after safety concerns were brought to its attention. Richards said the CAA had restricted the operating certificate of charter service Air Freight NZ Ltd. Temporary conditions which restricted its ability to conduct flights for Originair had been placed on Air Freight NZ's aircraft operating certificate while those safety concerns were investigated. Richards declined to comment further on the nature of the safety concerns or when the temporary conditions limiting Air Freight's certificate were enacted. He said the CAA "do not disclose details about an active investigation [but] suffice to say that we had concerns that warranted the steps we took". Originair is operated by Air Freight NZ, which is in turn managed by Fieldair Engineering Ltd. Fieldair's general manager Mark Troughear said the safety concerns at issue were "very specific to the particular operation" of Origin, but declined to comment on their nature. "We're not at liberty to talk about that outside of the CAA," he said. "The operation involves a whole lot of aspects. There's a number of things there that the CAA may look at." He did not believe the safety concerns were related to Originair planes, he said. He said the limits on Air Freight NZ's operating certificate did not affect any of its other commercial operations, which include an air ambulance. "There will be a small amount of costs that Air Freight will be absorbing while it can't operate," Troughear said, noting the inevitable cost of aeroplane fuel and airways. Richards, of the CAA, said Originair had contracted another operator, Airwork NZ Ltd, to conduct its flights while the CAA undertook the investigation. Originair stopped flying jetstream aircraft in its operating colours 10 days ago, instead using two unmarked Airwork NZ metroliners, owner Robert Inglis said. He and general manager Michael Curry said they were not aware of any issues with Air Freight's operating certificate. Inglis said "any issues between the CAA and Air Freight are between them". "The CAA wouldn't tell me about that because it's not my business." He said the decision to transfer its operation to Airwork, described by Curry as "like moving from Vodafone to Telecom", was primarily due to the operator's greater range of available aircraft. Inglis said the airline had considered changing operators in the new year and hoped to complete the transfer of its aircraft to Airwork in the next few days. He refuted any suggestion that the recent operator changeover was prompted by Air Freight's limited ability to conduct flights for the airline. Air New Zealand is streamlining its main trunk services and adding more flights during peak times. A new schedule will have services on the hour every hour between Auckland and Christchurch and hourly flights between Auckland and Wellington from May 2. It will also operate half hourly services at peak business times on both routes – increasing average weekday capacity between Auckland and Christchurch by 18 per cent and between Auckland and Wellington by 3 per cent. The existing timetable has flights between the main centres nearly every hour, however, there are longer windows between services around mid morning, noon and 4pm. Air New Zealand chief sales and commercial officer Cam Wallace said the amendments would result in a less complex schedule with improved connectivity and consistency. "We are continually reviewing and tweaking our network schedule to ensure we are matching capacity with demand and operating a schedule which best suits our customers' needs," Wallace said. The new schedule would be rolled out over the next week. The Dairy Flat airfield might start to look like this competition day if it gets much busier. The North Shore airfield at Dairy Flat is about to get much busier. A twice daily return flight to Auckland International Airport has been started by Barrier Air, Monday to Friday. And Tauranga based Sunair will have twice daily return flights on weekdays from Dairy Flat to Hamilton starting March 7, linking with existing services to Tauranga and Rotorua. It will also have a shuttle van service between the airfield and downtown Auckland. ‘‘We’re giving business people same day returns as we see an opportunity with the North Shore area’s burgeoning population,’’ Sunair chief executive Dan Power says. He says many people are seeing advantages in air travel over driving, especially in avoiding traffic congestion. Newcomers to the Postman Rd airfield, Sunair will have eight-seater Piper Navajo planes operating from there. The company has been running for 20 years and has 10 multi engined aircraft. Visit sunair.co.nz for more. Kiwi Regional Airline departed Tauranga for the first time today with a full flight bound for Nelson. Kiwi Regional Airlines chief executive Ewan Wilson said sales of seats on the twice-weekly flights to Nelson and on to Dunedin had been "excellent". "Tauranga is performing well for us against all our other routes, which is fantastic, given we have yet to fly in or out of the city. "Our experience highlights the need for affordable, direct, inter-regional air services in New Zealand, and vindicates our decision to add the Bay of Plenty as one of our key regions," he said. Wilson said Kiwi's SAAB340A aircraft was scheduled to arrive in from Nelson at 11.15am, departing 50 minutes later at 12.05pm. He welcomed members of the public coming to Tauranga Airport to view the aircraft from the terminal. Flights to Nelson with Kiwi depart at 12.05pm every Tuesday and Saturday, and fly on to Dunedin on Tuesdays. Thanks to the Hairy Mole Rat (SORRY LEFT THE RAT OUT OUT ON THE PHOTOS) who captured the departure of the first Kiwi Regional Airlines' first flight departing Tauranga on its first day of flights to the city on the 16th of February 2016. Wilson came under fire for splitting his time between city council and Kiwi Regional Airline where he is the chief executive. In May 2015, Deputy Mayor Gordon Chesterman said Wilson's civic responsibilities were being hampered and called for his head. "Being a city councillor in Hamilton is not a full time job," said Wilson. The new schedule continues to see four flights a week between Nelson and Hamilton on Sundays, Mondays, Wednesdays and Fridays. The Hamilton flights will connect with Barrier Air services at Hamilton to Auckland, North Shore, Kaitaia and Great Barrier Island. Meanwhile the Dunedin to Nelson route extends to five flights a week, with northbound flights operating daily except Sundays and Thursdays and southbound flights operating daily except Thursdays and Saturdays. Barrier Air launched its Auckland-Hamilton-Auckland service this morning with the arrival at Hamilton of flight GB55 from Auckland which was operated by Cessna Grand Caravan ZK-SDB under the command of Travis McKee. The flights will usually operate with two pilots and 11 flights are being offered each week. Leading the way across the tarmac, Nick Pearson, Barrier Air's Logistics Manager (left) talks to the company's Chief Executive Mike Foster. The mid morning flights will connect to Kiwi Regional flights to Nelson. Meanwhile Barrier Air's first Auckland-North Shore service operated on the 4th of February 2016 with Embraer 820 ZK-RDT operating the first service, flight GB310. A proposed regular flight service between the Mackenzie District and Christchurch has been slammed by a regional flights expert as a likely flop. Because of the recent growth of international and domestic tourism to Mackenzie – guest nights rose 12.2 per cent to 591,355 in 2015 – Christchurch and Canterbury Tourism (CCT) has launched a survey to gauge how much Mackenzie residents are interested in the return of a domestic service. Regular flights between Mt Cook and Rotorua ceased in 2002 and a month-long trial of a thrice-weekly service from Mt Cook to Christchurch by Air New Zealand subsidiary Mt Cook Airline at the end of 2012 was largely unsuccessful. Tekapo and Pukaki airports are favoured as the lead contenders for any future services to be based out of. CCT's Mackenzie marketing executive Annabelle Bray said international visitors' use of regional air services was "fickle" and locals would have to be the ones that airline companies could bank on to use it. Bray said CCT was making the survey available for Mackenzie residents as well as sending it to the Christchurch residents that were known to have holiday homes in Mackenzie. "Once we've collected the results, if residents are favourable to flights, the next step would be a feasibility study," Bray said. "We probably wouldn't run that but we would certainly assist someone to do it." Bray said Mt Cook flights were very popular but the service was often hindered by weather. "We haven't really talked about the logistics of how a new service might work but I would say Tekapo or Pukaki airports are probably the most realistic places to run it from today," she said. Kiwi Regional Airlines chief executive Ewan Wilson, a former Timaru man, said the population base of the region was not big enough to sustain regional flights. "Basically you need at least 20,000 people flying to a major city for it to work unless there is a large corporate base that would support it," Wilson said. "If you were flying over a stretch of water that might change but that's not the case here. Tourism is important to Mackenzie but without all the data I see them as mostly passing through to get to Queenstown, Mt Cook, Wanaka rather than flying there as a destination. "I think on the balance it would be a really hard sell to anyone." Pukaki Airport board chairman Derek Kirke said if Mackenzie residents wanted regional flights the board would do everything it could to support it. "As we've seen in Wanaka recently it's quite tough setting up commuter services out of small centres. "But beyond the size of the airstrip required, and that will depend on what aircraft it's decided will be used, there's really no reason why we couldn't accommodate it here." Air Safaris chief executive Richard Rayward said Tekapo was a genuine option. "This is something we have looked at for a long time but it's not going to be good for anyone if it is uneconomic. We are all well aware that how often people say they will fly and how often they actually do is often wildly different. It's in the melting pot now so let's see what happens." 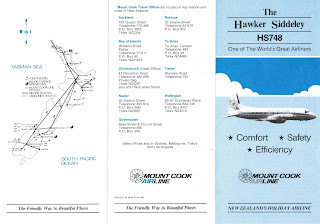 By the late 1970s the Mount Cook Group of companies was comprised of Mount Cook Airlines, Mount Cook Landlines, Mount Cook Coach Tours, Mount Cook Freightlines, Mount Cook Flightseeing, Mount Cook World Travel Offices, Mount Cook Sea Lines and Coronet Peak Skifield. The company looked to rationalise these individual companies under a single branding with which all operations could align themselves. The name chosen for the new corporate identity was “The Mount Cook Line” which came into being on the 1st of October 1979. Over the next few months the airline fleet was rebranded. Initially this involved changing the titles but after some years the 748 fleet was repainted with a light blue stripe passing down the length of the fuselage and sweeping up the tail bordered by narrow dark blue lines. 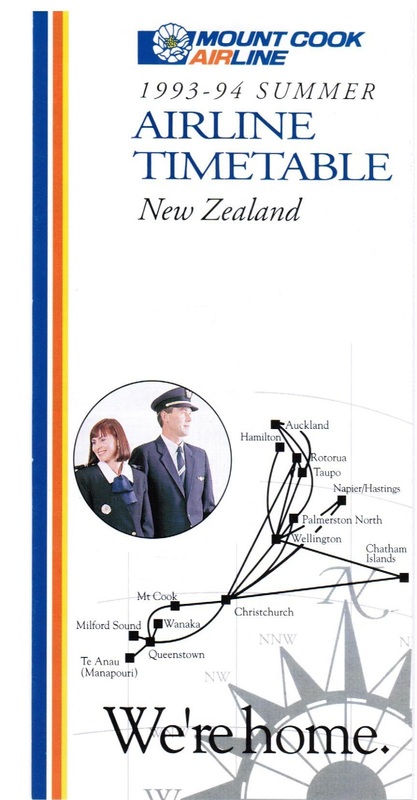 Air Pacific colour scheme - Mount Cook Line titles. Hawker Siddeley 748 ZK-MCJ at Christchurch in January 1980. From memory ZK-MCJ was the first to wear the new branding. The first attempt at a new Mount Cook colour scheme... Hawker Siddeley 748 ZK-MCF seen at Christchurch on 26 May 1982. It failed to impress and it was back into the paint shop rather rapidly. With the Group operating under one banner moves were made in 1980 to fill a gap in its portfolio, namely flying in its own tourist passengers from Australia. On the 20th of August 1980 the Mount Cook Group announced that it was seeking Government approval to operate scheduled Tasman air services from Christchurch to Sydney, Melbourne and Brisbane with a leased Boeing 727. It was envisaged the 727 would accommodate 130 passengers and that the start-up costs would be in the order $2.5 million in the first year. The company foresaw frequent summer services of up to two flights a day with a lesser winter schedule. The company’s plans came to nothing due to the death of the company’s managing director, Harry Wigley, the driving force behind the company and the proposed international air service. The Mount Cook Messenger, the company’s in-house newsletter wrote a fitting tribute. On Monday 15 September last Sir Henry Wigley, chairman of the Mount Cook Group, died — and the transport and tourist industry lost a great and colourful leader and pioneer. It is seldom that the son of a famous father does much more than to take over the reins. It is rare indeed for the son to equal the parent's deeds and even more to exceed those deeds. 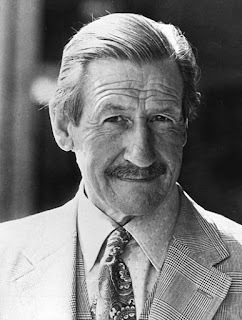 Henry Rodolph Wigley was born in February 1913 and entered a world of stirring action and development — much of it the product of his imaginative father, Rodolph L. Wigley, who had laid the foundations of the Mount Cook Group by pioneering long distance scheduled motor services in New Zealand's South Island. By the time young Harry, as he was to become widely known, was 10 his father had entered the world of aviation and the smell of aircraft fuel, canvas and paint became a vital part of his young life. While in his early twenties he learned to fly and, in partnership with his father, enthusiastically started an air service based on Queenstown and Mount Cook. But, the war interrupted his plans and in 1940 he received a commission in the Royal New Zealand Air Force. His early service mainly included training duties but in 1943 he was posted to an operational fighter squadron and flew three operational tours in the Pacific which included commanding a squadron. At wars end he was commander of an island base with rank of wing commander. Following his discharge he returned to the Mount Cook company to find that a combination of the depression of the thirties and the war had taken its toll on the finances of the company. With tenacity, Harry Wigley set to and step-by-step commenced rebuilding. Non-profitable assets were sold and gradually new vehicles began to appear. He early realised the potential of tourism and started selling direct by mounting sales campaigns to North America and Australia. He joined and attended Pacific Area Travel association conferences. Slowly the name of the Mount Cook organisation came to the fore aided greatly by the many innovations that Harry' Wigley continued to introduce. In 1955 he successfully combined two of his great loves, skiing and flying, and started the famous ski-plane operation in the Mount Cook area. The early sixties saw him bring to realisation a long-time dream — a scheduled air service linking the key southern resorts with Christchurch. At his death he was head of an organisation generally considered as New Zealand's most versatile, if not the largest, private enterprise transport organisation with a nationwide air service and coach operation, travel offices in most main centres and tourist resorts, flight-seeing and sightseeing activities in both islands plus interests in accommodation, agricultural aviation and much more. He had brought an excitement to the company and to the industry generally. He had grasped life firmly and enjoyed it the full and in so doing had widely and generously shared that enjoyment with his family and that even wider family of staff, everyone of whom felt it an honour to work for and alongside one of the noblest knights this country has ever seen. In 1981 Air New Zealand announced it would withdraw from the Napier-Christchurch route as part of cost-cutting measures. Until this time Mount Cook had focussed on tourist services but in September 1981 Mount Cook made its first attempt to operate a non-tourist service, applying to the Air Services Licensing Authority for permission to introduce a Hawker Siddeley 748 service between Christchurch and Napier. With both the Mount Cook Line and Air Central wanting to serve the route Air New Zealand decided against withdrawing from the service. Meanwhile, the Northland service between Auckland and Kerikeri was never the success story Mount Cook hoped it would be and because of this the route never sustained a 748 service. From November 1980 the airline was operating up to three flights a day on the route using one or two BN Islanders depending on loadings. The Islander was not an ideal aircraft and in mid-1982 the company introduced a faster and somewhat quieter Piper PA31-350 Navajo Chieftain, ZK-MCM. This saw service on flights to the Bay of Islands service as well as operating it on some flights between Auckland and Rotorua. In 1983 the Mount Cook Line hit turbulent skies as the Nelson-based TNL Group, which among other things owned Newmans, the rival tourist company, sought to take over the Mount Cook Group. Mount Cook was not impressed by the idea and in a full-page advertisement announced that it did not want "this unique company to become yet another autonomous division of a large trucking company." Air New Zealand, who had always had a good relationship with Mount Cook, were also concerned about a TNL take-over and sought to increase its holding in Mount Cook from 15% to 45% while at the same time Dominion Breweries Ltd acquired an 18.9% shareholding in the company. 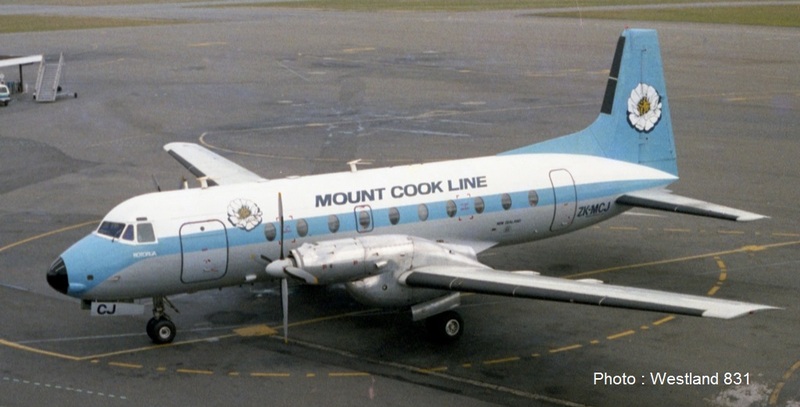 Ultimately the Commerce Commission refused TNL permission to make the full takeover of Mount Cook it was seeking and TNL moved to establish its own airline. Meanwhile in December 1983 Air New Zealand increased its shareholding in Mount Cook to 30% and then to 77% in October 1985. 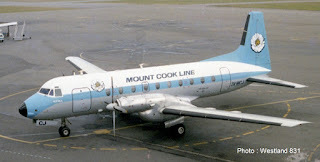 While Mount Cook’s aircraft were mainly used on their scheduled and tourist charter flights they were also used for other work. In June 1983 TNT introduced an overnight freight service to move South Island goods to Wellington and Auckland on a guaranteed overnight door-to-door service. The service used chartered Mount Cook Hawker Siddeley 748s. 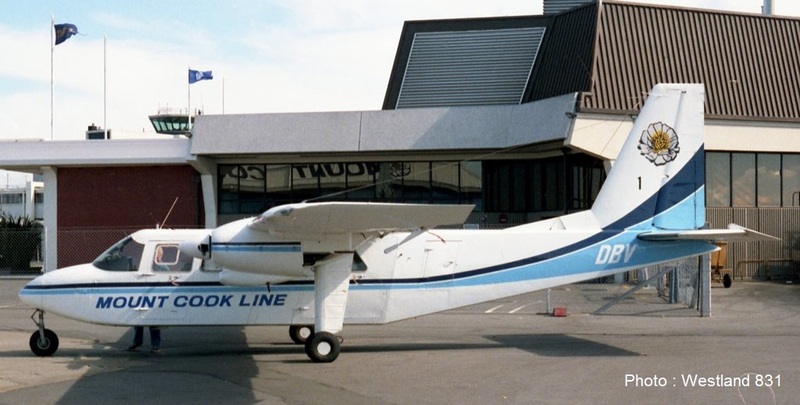 In January 1984 Mount Cook upgraded services from Auckland to Kerikeri and Rotorua by purchasing an 18-seat De Havilland Canada Twin Otter, ZK-MCO. This enabled the Piper Chieftain that had previously been used on these services to be transferred to the company's Christchurch base. The Twin Otter flew two return flights each day between Auckland and the Bay of Islands as well as between Auckland and Rotorua. The Twin Otter service, however, was short-lived and from the 24th of February 1986 it instead began flying between Queenstown and Milford Sound with the Chieftain returning to Auckland for flights to the Bay of Islands and Rotorua. For the summer of 1984/85 Mount Cook increased its 748 capacity by 50% with the return of the company's fifth 748 which had been on a two-year lease to Calm Air International in northern Canada and the purchase a sixth Hawker Siddeley 748 aircraft. The company's fleet at that time was 40 aircraft including the 6 Hawker Siddeley 748 airliners, 1 DHC Twin Otter and 1 Piper Chieftain, 6 Britten-Norman Islanders, 15 Cessna 185 and Pilatus Porter skiplanes, 11 agricultural aircraft and two non-flying historical aircraft, ZK-BDX the Auster that the first ski-landing and de Havilland 82 Tiger Moth ZK-BRC. Eventually all the Britten Norman Islanders were Queenstown-based operating scheduled services to Milford Sound, Te Anau/Manapouri and Alexandra and Dunedin as well as their major work, flightseeing to Milford Sound. Here three are seen with Mount Cook Line titles. Above, ZK-MCB at Dunedin in 1980, centre, ZK-DBV at Christchurch on 14 September 1985 and bottom, ZK-MCD at Queenstown on 24 October 1987. In October 1984 plans for the launch of TNL’s airline, named Newmans Air, was well under way. Nonetheless, the TNL Group’s board continued to believe that a combined operation with Mount Cook would be “in the best interests of the shareholders of both companies and the future prosperity of the tourist industry." Newmans Air began operations on 13th of February 1985 operating two De Havilland Canada Dash 7s. Mirroring the Mount Cook tourist routes Newmans flew Auckland-Rotorua-Christchurch-Mount Cook (Glentanner)-Queenstown services. Mount Cook Flight NM5: August 16. Time in air: 1hr 50min. The first of two phone calls to the airline's reservations number was answered promptly; the second produced recorded music for 3min 10sec before my inquiry was handled. After a smooth check-in at Rotorua, passengers boarded the 748 and were directed to their seats by the hostesses in a pleasant manner. My seat was comfortable with adequate leg room, but I had limited space for' my feet and brief case under the row in front. Pre-flight emergency instructions were announced clearly. There was no visual demonstration of the procedures. A safety card and airline magazine were in the seat pocket. An excellent selection of magazines was offered after take-off and passengers were given a choice of tomato or fruit juice. A highlight of any Mount Cook flight is when the captain invites passengers on to the flight-deck: on this flight the door was left open for visitors (two at a time) for about an hour, thereby affording those passengers in rows where viewing was obstructed by the wings an opportunity of seeing the mountains at their winter best. The food service began about 30 minutes into the flight when the hostesses handed out wicker baskets containing a fresh club sandwich, piece of iced shortcake, kiwi fruit and a mini-pack of raisins with plastic knife, spoon, stirring straw, sugar and serviette. My sandwich contained lettuce, cheese, and ham. (The airline's food from Rotorua is also produced by Glenis and Ray Robinson). Vegetarian food is carried only if requested in advance. A hostess answered my call button promptly, but was unable to produce either an Air New Zealand or a Mount Cook Airline timetable. Hot drinks were served in cardboard cups with flap handles. The cabin was cleared 40 minutes before landing. Frequent informative announcements were made from the flight-deck drawing passengers' attention to points of interest along the way. Engine noise was noticeably louder towards the front of the cabin. The lavatory at the rear of the aircraft was clean, but the seat had to be held up by hand. Toffees were offered before landing. Baggage was available for collection nine minutes after arrival at the gate. The launch of Newmans Air didn’t mean, however, that the battle for the ownership of the Mount Cook Group had ended. In May 1985 the Commerce Commission rejected a bid by the Nelson-based Goodman Group Ltd to acquire 47 per cent of the Mount Cook Group. At that time the Wellington based Goodman currently held 19.9 per cent of Mount Cook and had been seeking approval to buy Dominion Breweries Ltd’s 27.04 per cent of shares. The Commission’s decision was coloured by Goodman's 24.9 per cent shareholding in Newmans Group Ltd. It said that in the Commission's view the public interest was best served by having two vigorous operators in the principal tourist air routes. It considered that competition between Mount Cook and Newmans would be likely to bring real benefits to New Zealand. Despite the competition from Newmans Air, Mount Cook’s passenger numbers continued to grow. The company carried 178,668 passengers in the first six months on 1985, up from 143,813 for the corresponding period the previous year, an increase of 24 per cent. Even before the competition took to the air Mount Cook had started to revamp its Hawker Siddeley 748 fleet. 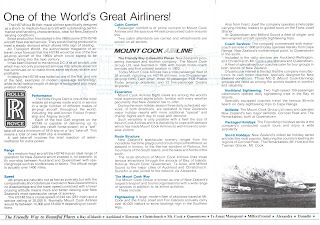 In November 1984 the airline was branded as Mount Cook Airline. A new colour scheme was introduced with a broad blue stripe with white, red and yellow stripes above. The 748's cabins were refurbished with the seating capacity being reduced from 48 seats to a more comfortable 44 seats. In August 1985 Mount Cook introduced new uniforms for the cabin attendants. The company also introduced non-stop flights from Christchurch to Queenstown, and reintroduced non-stop flights between Rotorua and Mt Cook, from the 14th of October 1985. Over the year Mount Cook chartered Fokker Friendships. The Civil Aviation Division’s Fokker F27 Mk 200 Friendship ZK-DCG was used in 1981 and ZK-DCB was used from 1986 to 1988. On both occasions the Friendships carried Mount Cook titles. The Following its retirement from Air New Zealand Fokker F27 Mk 100 Friendship ZK-BXF saw service with Mount Cook Airline from 1991 to 1994 and this was painted in full Mount Cook colours. In 1988 Mount Cook also used Bell Air’s Beech 99 ZK-LLA on services between Auckland and Rotorua and again this aircraft carried Mount Cook titles. Chartered Fokker Friendship ZK-DCB at Twizel's Pukaki Airport on 16 April 1988 after diverting from Mount Cook due to high winds. Fokker Friendship ZK-BXF arriving at Rotorua on 23 January 1992. I think the scheme on the Friendship looked better than on the Hawker Siddeley. In the early 1980s Nelson saw the rise of the commuter airline Air Albatross. Following its collapse a new operator, Pacifica Air, was established and it introduced flights from Nelson to both Christchurch and Wellington in April 1987. Fearing competition in the Nelson market Mount Cook, which was now completely owned by Air New Zealand, introduced twice daily Hawker Siddeley 748 flights between Christchurch and Nelson. Flights were timed to run at the same time as Pacifica Air. Mount Cook’s first service into Nelson was flown on the 21st of September 1987 in Hawker Siddeley 748 ZK-DES. 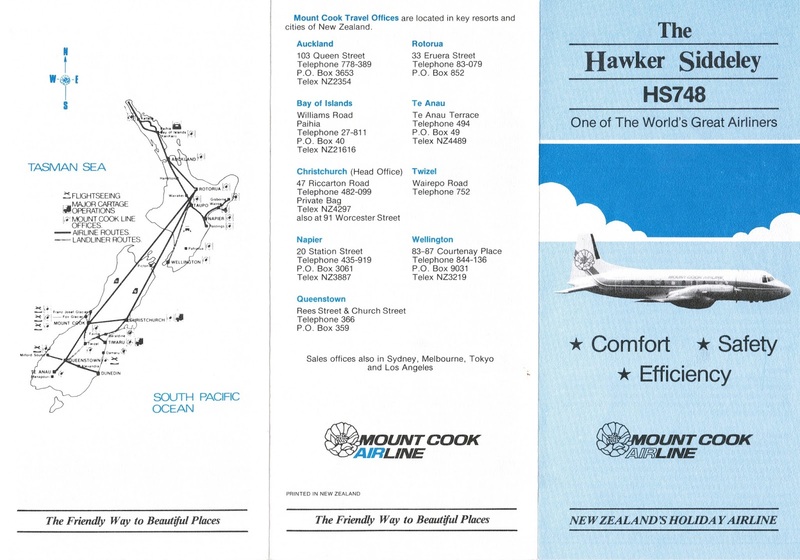 Further expansion occurred the following month with Taupo and Wellington being added to the Mount Cook Airline network for the first time from the 23rd of October 1987. The northbound flight departed Christchurch at 6.50am reaching Wellington at 7.55am, departing again at 8.25am and reaching Taupo at 9.35am before continuing on to Rotorua where it arrived at 10.15am. The southbound flight from Rotorua landed at Taupo at 5.10pm, Wellington at 6.35pm and Christchurch at 8.15pm. In 1988 Air New Zealand was looking to reduce its Fokker Friendship fleet. At the same time it wanted to introduce an early morning service between Nelson and Auckland. To help Air New Zealand facilitate these aspirations Mount Cook Airline introduced four weekday return flights between Nelson and Wellington. A reduced service was offered over the weekend. These flights commenced on the 28th of March 1988. At the same time an extra Nelson-Christchurch service was introduced. With Pacifica Air and Air Nelson also operating the Nelson to Wellington route there were 19 flights each day! With such competition something had to give and on the 7th of June 1988 Pacifica Air withdrew all its Nelson flights and instead operated flights from Christchurch to Alexandra and Wanaka. 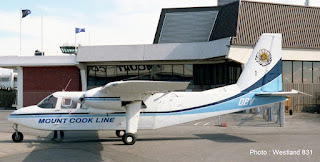 Mount Cook also set out to compete with Pacifica Air's flights to Wanaka and from the 28th of March 1988 they introduced Britten Norman Islander flights between Wanaka and Queenstown to connect with the Mount Cook flights to and from Queenstown. In the late 1980s and early 1990s a second Piper Chieftain, ZK-EBT, was leased from Airwork. This saw service on the Kerikeri and Rotorua routes as well as continuing to operate the Auckland-Tokoroa air service that Airwork were operating. It later saw service on flightseeing in the South Island. In August 1990, following the announcement of Safe Air’s closure of its air freight and airline services, the Chatham Islands’ Local Authority Trading Enterprise Board chartered Mount Cook Airline to operate a temporary air service between the Chatham Islands and the mainland until a permanent service was established. These first services were flown in October 1990 with a return flight to the Chathams being operated from Christchurch on Mondays with additional flights being operated from Wellington on the 4th and 25th of October. Mount Cook subsequently secured the contract to operate a permanent Hawker Siddeley 748 service to the Chathams. A Christchurch-Chathams-Christchurch service was operated on Saturdays and a Christchurch-Wellington-Chathams and return service operating on Tuesdays. Air New Zealand’s purchase of Eagle Air and a 50% share in Air Nelson led to the withdrawal of Friendship fleet and on the 15th of April 1991 there was a reshuffle of Mount Cook services. From that day Mount Cook pulled out of its Nelson services in favour of Air Nelson while in return Air Nelson quit Rotorua. Mount Cook then increased its Wellington to Rotorua return services from two to three a day as well as launching a daily return service between Wellington and Hamilton, and flights from Palmerston North to both Auckland and Christchurch. 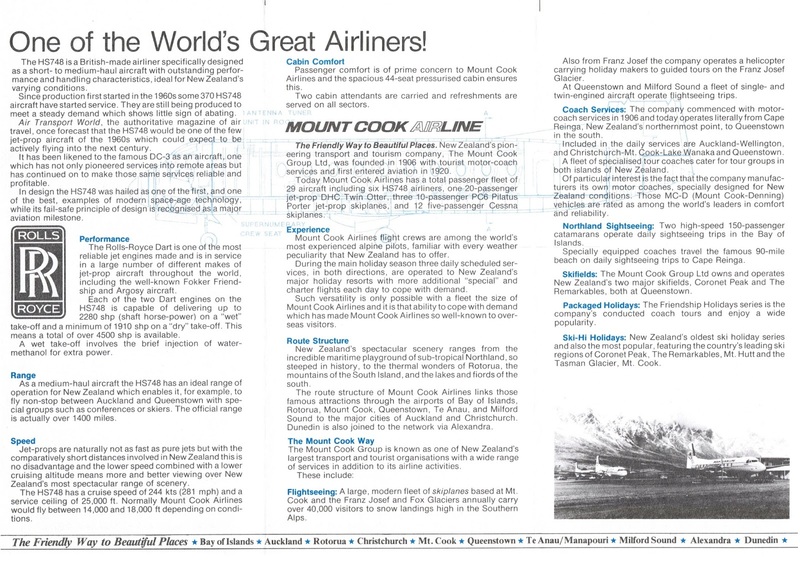 On the 18th of April 1991 Air New Zealand acquired 100% interest in the Mount Cook Group. Up until this point Mount Cook always had 748s available for special flights in support of the tour business. Now scheduled services throughout the country increasingly demanded the whole 748 fleet and the tourism focus of the airline started to wane. Later in the year, on the 1st of July 1991, Mount Cook withdrew its Queenstown-Alexandra-Dunedin service. This service, which had operated since the collapse of SPANZ, was poorly patronised and no longer economically viable. I never managed to source a photo of a BN Islander taken at Alexandra... ZK-DBV is seen here at Queenstown on 19 March 1989 wearing its Milford Sound Flightseeing titles. This was the main work for the Islanders. In the 1990s there was still no adequate IFR approach into Queenstown. This meant the Mount Cook’s 748s did an IFR approaches on the Alexandra NDB before flying visually through the Kawarau Gorge to Queenstown. The aircraft would keep to the right hand of the valley to keep clear of any traffic coming the other way. There were two missed approach points where the aircraft could turn and retrace its steps back to Alexandra at Roaring Meg and Wairtiri Station. This wasn’t always easy and one story is told was of a 748 holding in a turn in the Gorge for 45 minutes waiting for snow showers ahead and behind of it to clear. There was, as is still the case, no night flights into Queenstown. With a growing number of tourists wanting to access the Queenstown skifields in the winter of 1992 runway lights were installed at Alexandra allowing Mount Cook Airline to operate evening Hawker Siddeley flights into Alexandra with bus connections to Queenstown thereby giving a same-day Australia-Queenstown connection for skiers. 1993 saw the introduction of a Wellington-Napier overnight service and the take over of Taupo services that had been operated by Eagle Air. The Taupo-Auckland services were initially flown with a Piper Chieftain three times a day but later this was changed to a Chieftain flight and a 748 flight. After Air New Zealand withdrew its Friendship services to Taupo Air Nelson operated flights between Wellington and Taupo for a brief period from late 1990 to mid-1991. The Air Nelson service was replaced by Mount Cook Airline which operated two 748 flights to and from Wellington, one via Rotorua and the other direct. A sixth Hawker Siddeley, ZK-MCB, arrived on lease in December 1993. 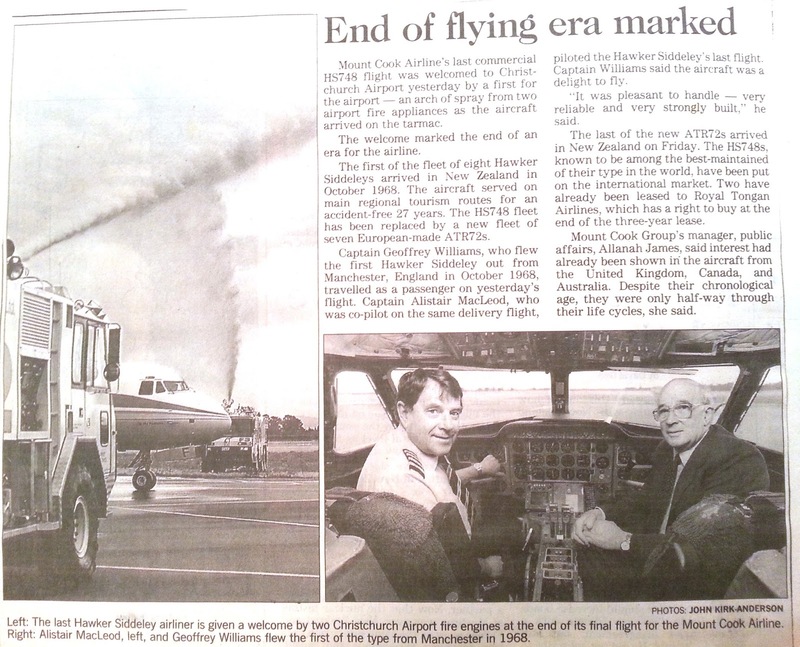 In late 1994 an air war raged between Mount Cook Airline and Air Chathams on the air service to the Chathams. 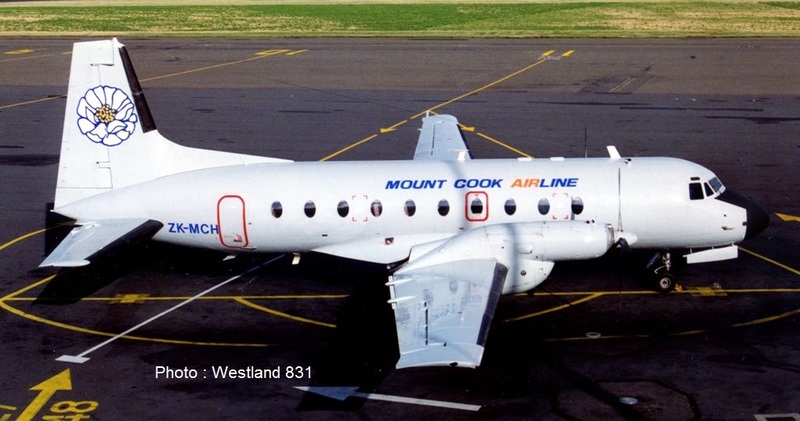 Mount Cook heavily discounted its fares and boosted its services to five flights a week operated by their 748s or chartered Metroliners. The fierce competition continued throughout 1995 until Mount Cook suddenly withdrew from the Chathams on the 29th of January 1996. 1995 saw a number of changes for the Mount Cook Group. A second Twin Otter, ZK-TFS, was added to the fleet for Milford Sound flightseeing services but this occasionally did overflow service to Mount Cook and Christchurch. Helicopter operations began from Mount Cook initially using two AS350 Squirrels but later using BK117s. The company also leased United Aviation's Navajo ZK-KVW using it for flightseeing based out of the Pukaki airstrip near Twizel. On the airline scene a seventh Hawker Siddeley 748, ZK-MCH, was leased to boost capacity over the 1995-1996 summer but an even bigger change was the announcement that the Hawker Siddeley’s were to be replaced with 66 seat ATR 72s. Hawker Siddeley 748 ZK-MCH flew for Mount Cook for about 8 months. It is seen here at Christchurch on 8 November 1995. Piper Chieftain ZK-KVW on 14 December 1995 while based at Pukaki Airport near Twizel waiting for its next flightseeing customers. The arrival of the ATRs signaled the end of the familiar Mount Cook lily that had been on the tail of Mount Cook aircraft since the first DC-3 services began in 1961. The ATRs were painted in Air New Zealand Link colours and the first ATR 72 began service on Monday, the 27th of November 1995 with flights operating from Christchurch to Invercargill and Dunedin. The following year, on the 12th of February 1996 Mount Cook Airline flew its last commercial Hawker Siddeley 748 service from Wellington to Christchurch. The final service was flown by 748 ZK-MCF under the command of Captain Alistair MacLeod. He had been the co-pilot on the delivery flight of ZK-CWJ in 1968 and for the final flight one of his passengers was retired Captain Geoffrey Williams who had been the captain on the delivery flight. The final flight ended 27 years of service by the Hawker Siddeley 748 in New Zealand and the Mount Cook lily being seeing on airline services in New Zealand.